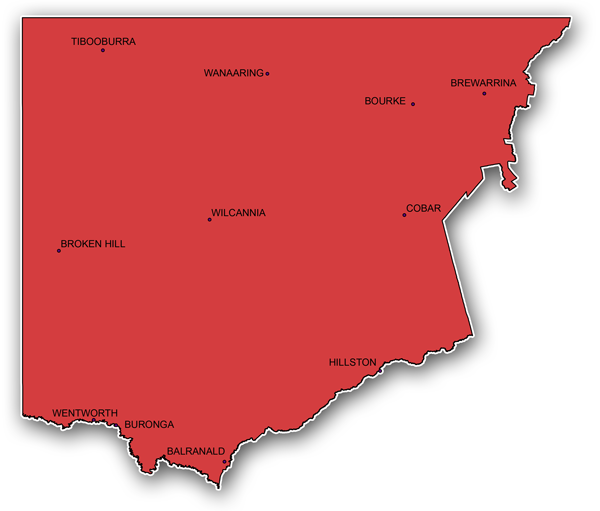 The Western Local Land Service region is the largest in NSW, covering 314,500 km² or 40% of the state. Despite its size, it is the least densely populated region, with a population of approximately 42,873 people. There are many sites of cultural significance including the Brewarrina Fish Traps, Mt Grenfell, Willandra Lakes World Heritage Area, Lake Victoria, Mt Hope and Mutawintji Historic Site. There are 16 current Aboriginal language groups identified. The Barwon-Darling River System, part of Australia’s longest river, transporting water 2,000 km through a single, meandering channel is located entirely within the region. The Murray River forms one boundary while the Murrumbidgee River forms another. There are a number of smaller and ephemeral rivers and creeks. Major water storages include The Great Artesian Basin, Menindee Lakes and Lake Victoria. It is a predominantly flat area that is interrupted by stony ridges and ranges. The Western region encompasses one of the most diverse rangeland areas in Australia, comprised of arid and semi-arid land, mostly unsuitable other than in the southern and eastern parts of the region for intensive agriculture practices because of constraints such as unreliable rainfall and soil type. Approximately 95% of the Western region remains uncleared, however, the condition of the landscape is variable due to impacts of total grazing pressure and changes to fire regimes. Vegetation ranges from mallee and murray pine woodlands in the south, riparian floodplains and wetlands associated with the river systems, chenopod shrublands in the far west, bimble box woodlands in the central parts of the region to mulga woodlands, brigalow gidgee in the north and floodplains of Coolabah blackbox in the north east. A range of iconic threatened fauna in the region include the kultarr, malleefowl, yellow-footed rock wallaby, tawny crevice dragon, western pygmy possum, plains wanderer, red-tailed black cockatoo, glossy black cockatoo, pink cockatoo and grey grasswren. The mallee spinifex vegetation communities support the majority of the threatened species in the region.